#AFAC2018 - The Australia Fire and Emergency Conference 2018 We Compare the Elliott Welding Screens … so you can choose what’s best for you. Elliotts have over 50 years’ experience in safety glove design, using state of the art high-tech fabrics and engineering and using a wide range of glove and palm coatings and finishes – Elliotts’ design gloves to suit every working environment. In this blog, we will give you an overview of the features and benefits of each of these coatings and finishes so you can make the right choice of glove for yourself or your customer. Nitrile is strong, does not cause allergic reactions and therefore has a wider range of applications. It offers excellent resistance to punctures and tears, and stands up well to water and oil, making it a good choice for handling small oily parts. Nitrile performs well in temperatures ranging from -4°C to 149°C. The T-Touch coating is a proprietary breathable nitrile foam that offers levels of performance focusing on wearer comfort. T-Touch is highly flexible and soft yet offers excellent abrasion resistance grip especially in oily conditions. The breathable foam coating provides high levels of air permeability which minimises sweating and improves wearer comfort. • Highly breathable nitrile micro foam finish. • Very soft and comfortable. • Excellent grip in wet and oily conditions. The Sandstorm coating is a unique breathable nitrile foam coating with a sandy finish. When the Sandstorm coating comes in contact with smooth, oily surfaces, the unique honeycomb surface will soak up the oil and provide improved grip. Gloves with the Sandstorm coating offers excellent resistance to punctures, snags, tears, abrasion and cuts and stands up well to oil, making it a good choice for handling small oily parts. • Sandy nitrile foam finish. • It is flexible and has good abrasion and puncture resistance. • It repels oils, grease, animal fats and many solvents. • The finish acts like a sponge and improves grip. The AirTouch coating is a unique Nitrile Foam Micro finish. The AirTouch micro surface is infused with thousands of tiny bubbles that act like suction cups and will soak up and absorb the oil but will limit the penetration of the coating through to the hand. • Nitrile foam micro finish. • High levels of dexterity and extremely breathable. • Extremely soft with highest comfort levels. • Lower soak through rate than foam nitrile. • Will perform in dry conditions but performs best in wet conditions. Nitrile, as a smooth coating provides the wearer excellent dry grip and liquids will not be absorbed through the coating which will keep the hands dry. • Good levels of dexterity and very soft. • Performs in wet and dry conditions. Latex is extremely elastic, flexible and soft yet tough and durable as a coating that provides protection from physical hazards such as cuts, punctures and slashes and provides outstanding grip. • Smooth or crinkle finish. • Very high elasticity and grip. • Flexible and can withstand abrasion and puncturing. • Provides protection against alcohols and some ketones. • Not recommended for use with hydrocarbon and organic solvents, including gasoline. • Performs well in extreme temperatures. Caution: products containing natural rubber latex may cause allergic reactions in some individuals. Polyurethane coated gloves are great for handling small parts where high dexterity is required. Polyurethane delivers excellent grip, puncture and abrasion resistance while providing protection against oils, fats, and greases. Polyurethane is soft and flexible which means it can be applied in very thin coats, allowing for excellent dexterity and tactile sensitivity. • Good grip without being sticky and doesn't shed. • Great breathability as it is microporous and therefore provides the hand with ventilation. • Resistant to wear, abrasion, tearing, harsh oils and chemicals. • Doesn't go hard in the cold or go soft in the heat. • Coatings can be very thin, are soft and flexible providing excellent dexterity and touch sensitivity. • Performs best in dry conditions. Polyvinyl chloride (PVC) offers good abrasion protection, flexibility in cold temperatures and excellent resistance to resins and glues. PVC also holds up well in the presence of water and most aqueous solutions, detergents, and diluted bases and acids. PVC does not cause allergic reactions and is stronger than latex or nitrile. PVC is ideal for working applications where adhesives/glues are used as it will not stick to the PVC e.g. Woodworking. PVC stays flexible at lower temperatures, so it is the ideal glove for cold weather. • Smooth or rough finish. • The best option for handling adhesives/glues. • Excellent choice for cold weather. Neoprene has good abrasion and cut resistance and is often used when heavy-duty protection is required. Neoprene resists degradation which means gloves made of this material will normally last longer. Neoprene has a high level of chemical stability and is therefore resistant to a wide variety of acids, oils, solvents and caustic agents. Neoprene also has good flame resistant and heat resistant properties. Neoprene gloves are commonly used for chemical resistant applications and applications where heat and fire-retardant properties are required. • Resistant to a variety of acids, oils, solvents and caustic agents. • Excellent grip in all conditions: dry, oily and wet. Each of these coatings and finishes has specific features and benefits and knowing which coating or finish best suits the tasks performed by your customers is an important part of choosing the perfect glove. 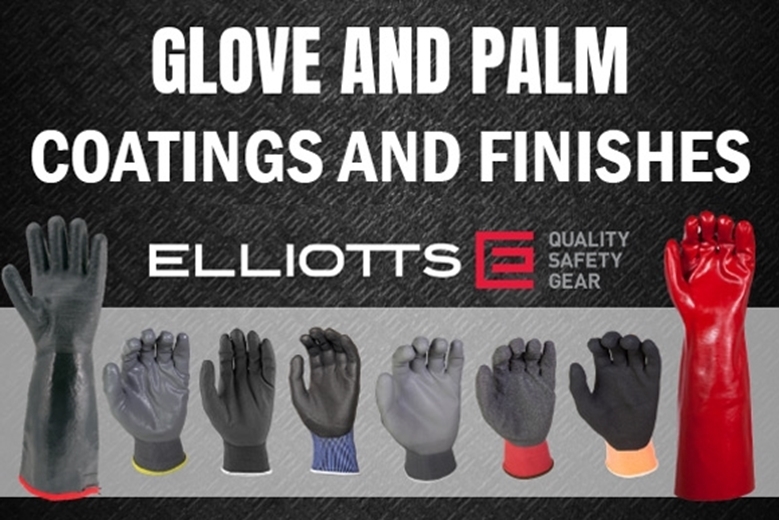 Now that you’ve got a better idea of Elliotts’glove and palm coatings, and finishes, have you decided which gloves are best for you or your customers? Contact Elliotts if you need any more information – call us on 07 3265 2944 or visit our Contact Page. EN388:2003 Vs EN388:2016 - What Is The Difference?